While scrolling through Instagram in late 2013, college sophomore Ellen Yin saw an ad for Ledbetter, a health and fitness company. She was intrigued, so she bought a three-month personal training program. She had no idea the purchase would help her land a remote internship, score a full-time job and pay off $19,000 in student loans… before she even graduated. What?! I know. Here’s the story of how she accomplished it all. After purchasing Ledbetter’s program, Yin stayed connected with the company via its social media channels. Soon, she developed a personal friendship with Josh and Julie Ledbetter — the married-couple CEO and COO. In turn, Yin shared some of her own milestones and lessons learned through comments on Facebook and Instagram. And when she visited a friend at Colorado State University in Fort Collins, she was comfortable enough to ask the Denver-based Ledbetters if they’d like to meet up and chat. During their two hour lunch meeting, Yin took a leap — and pitched them an internship. She needed to complete a 60-hour practicum for school, and even though she wasn’t studying public relations or marketing, she knew the Ledbetters could use help with their YouTube channel and blog. Everything seemed to click into place. And although her pitch was pretty casual, it was successful. During the initial unpaid, three-month internship, Yin accomplished many of the goals she’d set and grew to feel like she was part of the small startup’s family. So when the topic of planning for her next required internship came up at a summer dinner with some classmates, she knew what she had to do. She texted Josh Ledbetter to say she wanted to pursue a second internship — and that she hoped it would lead to a permanent position. “I knew that (I) was taking a risk,” says Yin. Ledbetter’s a startup with a small team and finite funding, and she didn’t know if her candor would be read as too brazen. But in retrospect, Yin attributes a huge part of her success to her honesty in pitching the internship and job. In being transparent about her intentions, Yin created space for the Ledbetters to have a frank discussion to see where she would fit in their company’s growth. After Josh responded with a tentative yes, Yin wrote a formal proposal, identifying three tangible improvements she wanted to make in the company’s public relations. She planned to expand the wholesale program, create an ambassador program and increase media presence. During her second three-month unpaid internship starting in August 2015, she was able to accomplish all of those goals. 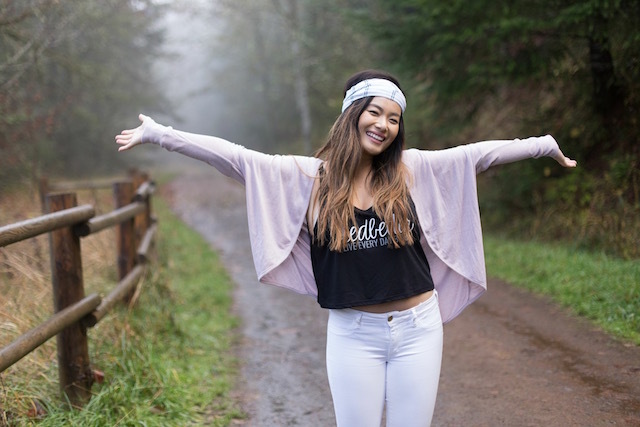 Along with placing Ledbetter headbands in her college store and a downtown Corvallis, Oregon, boutique, Yin also organized a breast cancer walk fundraiser, organized a photoshoot for the site and relaunched the company’s YouTube channel. She helped build the ambassador program she’d pitched from the ground up (down to writing the application) — and she managed the company’s blog, which saw an increase from seven to almost 400 unique visitors per day. So it wasn’t that surprising when, after flying Yin and the rest of the company out to Breckenridge, Colorado, to partake in David Ramsey’s leadership conference, the Ledbetters agreed to upgrade Yin’s internship to a part-time, paid position for the rest of the school year, then a full-time job once she graduated. Some of the keys to her success? Yin knew her strengths and found actionable ways to apply them to the company’s needs. “Look at a company and see which areas they lack in, or what you, uniquely, can solve,” Yin says. Then, follow through and create tangible results, so the value you add to the team is obvious and unquestionable. “Give first, and then ask for a mutual thing in return,” Yin suggests. In her case, she showed what she could do during her first internship, then pitched a second internship — with the potential for a full-time job afterward. But this tactic might not work for everyone. “I know a lot of people who are full time in the working world can’t afford to just take three months off and work for free,” Yin says. Another takeaway from Yin’s story: You have to be willing to ask for what you want. Talking to strangers doesn’t come easy to everyone. It sure doesn’t for me. But none of this would’ve happened for Yin if she hadn’t taken the first step to reach out. “If there is a company that you’re really passionate about working for that you really believe in their mission and you would love to be a part of their team… try to start developing a relationship with them,” Yin explains. In her position as public relations director, she continues to actively seek relationships with big companies like Bodybuilding.com — even if she’s not sure it’ll work. If this all sounds like a lot to you, keep in mind it’s OK to be afraid — Yin certainly was. “I don’t have any experience in PR, so when I [got] this position, I was scared, of course,” Yin explains. And even if you’re an expert in your field, it’s easy to feel inadequate for loads of other reasons — like if you don’t yet have any work experience. But Yin knew how to overcome her nerves. “I just told myself, everyone is always learning,” she says. The moment you stop learning is when you’re really in trouble. Yin transformed her fear into an opportunity to overcome an obstacle — and earned valuable connections and a fulfilling career in the process. While she finishes school, she works 20 paid hours per week for Ledbetter, managing its Instagram and email correspondence, doing monthly evaluations for the ambassador program she created, and more. Plus, the job has helped her pay off almost $20,000 worth of student debt in less than a year. In fact, Yin is on track to be completely student-loan-free before she graduates in June. And before you ask, no, she doesn’t live with her parents. After reading Ramsey’s “Total Money Makeover” — a gift from the Ledbetters — Yin was inspired to gain financial freedom. So she cancelled her loans for her final year of school and started devoting almost her entire paycheck to paying down her student debt. To pay for rent, bills and everything else, she uses the wages from her second job at Applebee’s, where she puts in 15 to 20 hours a week on top of her full-time studies and presumably catching a few hours’ sleep here and there. She also continued to apply for scholarships after enrolling in school, which earned her about $10,000. When she graduates in June, she’ll work for Ledbetter full time — but she’s staying in Oregon for now. Since she’s prioritizing her financial freedom, she wants to think hard before investing in a move. Plus, Denver — as you may have heard — is snowy. “I’m not really a snow person,” says Yin. Your Turn: Have you ever created a job for yourself?